I was very happy with the light output from these. I previously had a pair that had terrible light dispersion. These were excellent, and installed in perfectly. They are pure white, with a hint of blue. My son loves his new lights. They are very cool. I like the slight blue tint when you see things at night. Very cool! I was very pleased with the results from my order. They arrived on time and came in very nice packaging, they are working perfectly fine. No trouble what so ever and I will most likely be buying from them again. I strongly recommend them if you are trying to find HID's. Again after a long search. I purchased my bulbs at a low price, what else can I say. I can not understand why anyone would buy the same item elsewhere and pay more. I have my bulbs installed for a week (I paid someone else to do it), and it is still working good with the ballasts that I ordered from different seller. Very bright that I don't need high beam anymore. Bulbs came quickly and shine very true and bright. Any problems I had were resolved almost instantly with their great customer service. HIDs were perfect. both came on and no DOAs. Got them install and was a perfect pink. Will buy from this seller again. Went into my 2004 civic Fog lights. Recieved bulbs way before the expected date. The price was great which was also my reason for purchasing this product. Bulbs are exceeding my expectations so far. Nice white 8000k hid light. Hopefully I will get some long life out of them. I installed these on my fog lights, much brighter than the factory bulb. You can actually see some light on the road with hid. This category of bulbs was added to our range of application recently to provide an additional comfort as well as luxury to the most modern vehicles that are present in the road nowadays. 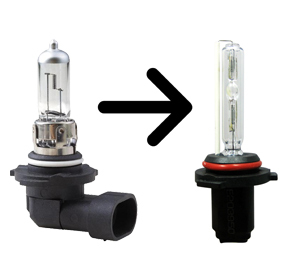 These H10 bulbs help you to accessorize your vehicles without spending a lot of money. There is no need to customize your vehicle with a lot of conversions. These h10 bulbs provide the necessary conversions at a very lesser cost. These bulbs guarantee the safety as well as the luxury of the vehicle at a next to nil cost required for customization. These are mostly applicable for vehicles that require high intensity fog lights. These can be provided in SUVs, cars and heavy duty vehicles such as trucks. The most attractive feature is the replacement facility that is provided by the dealer on any damage to the parts within one year of purchase.